My biggest pet peeve about play dates is this: regardless of whatever toys Hannah enjoys playing with in other people’s homes, she always focuses on the one toy that is no longer being manufactured. 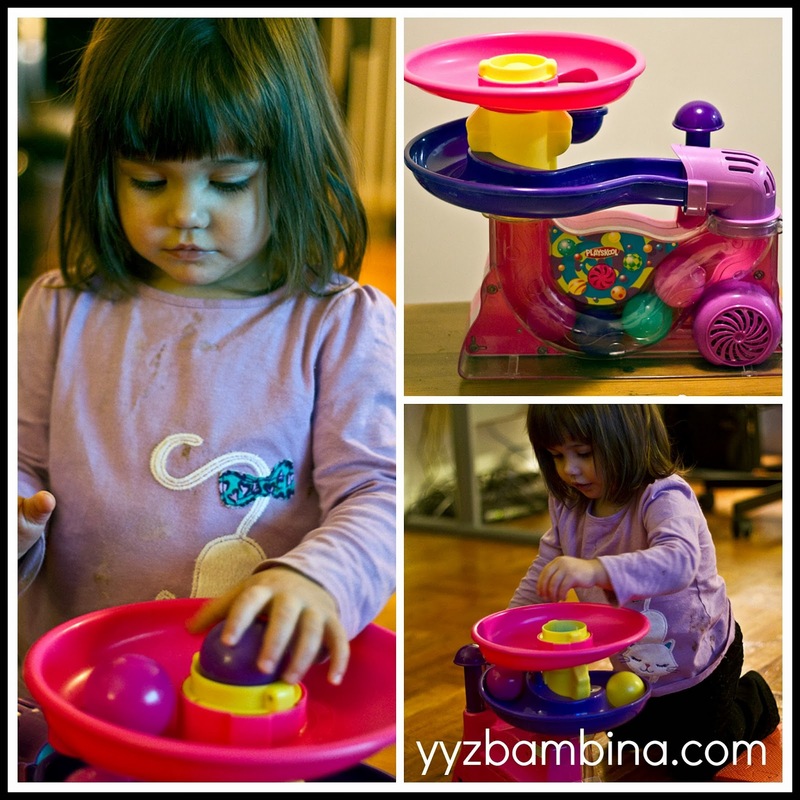 Enter the Playskool Busy Ball Popper. Hannah played with this at TWO different homes for a long period of time. The squeals emitted from her mouth and the smiles on her face even led me to take video on one occasion. Of course, I searched for said toy for weeks afterwards. I could only find it on Amazon…at a pretty costly price. Playskool now makes some sort of Elephant Ball Popper, but it was not the one Hannah had fallen in love with. If your child ever falls in love with a toy that is no longer being manufactured, go directly to Boomerang Kids - North America’s first and only resale chain of stores carrying new and nearly new children’s merchandise that’s available in-store and online. I hopped on to their website, quickly found a gently used Playskool Busy Ball Popper and Hannah was happily playing with it, now her very own, the very next day. You can choose to pick up at a store (there is a recently opened Vaughn location for those who reside in the GTA and many stores in the Ottawa-Gatineau region where Boomerang Kids is already well established) or have goods delivered to your home (our Ball Popper was only in Ottawa so it got mailed to us via Canada Post with helpful email updates while the package was en route). All items are inspected by Boomerang Kids staff before being accepted. Our Busy Ball Popper came out of the shipping box looking like it was brand new – it even had batteries! And it’s not just toys – Boomerang Kids accepts and sells all types of items – clothes, baby gear and equipment, and more. They even have a Maternity section! Some items are gently used, and some items are "factory fresh"! You can browse online by brand, size or category – or any combination thereof, filtering down your preferences. 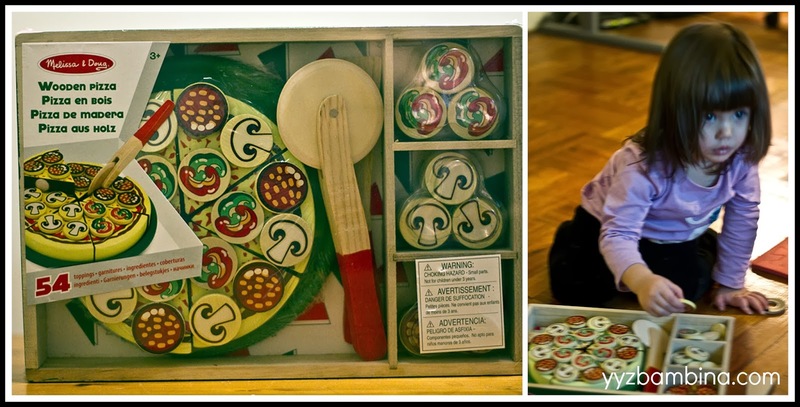 Speaking of factory fresh, Hannah also got a Melissa & Doug Pizza Party set, brand new, at the lowest price I've ever seen it. Whenever Hannah sees pizza, she lets everyone know, "I like pizza." So she loves this set where she can make her own! I will continue to browse Boomerang Kids for all of Hannah's needs...and when Hannah starts to tire of some of her toys I will happily become a Boomerang Kids consignor in hopes that we can magically help another family find that perfect toy. We are so thankful to that Ottawa family who handed over their Busy Ball Popper - and for Boomerang Kids for making it all possible! Do you shop or sell at consignment stores? Disclosure: I received a Boomerang Kids Gift Card for the purpose of this review. As always, opinions on this blog are my own. I shop occasionally at consignment stores. We don't live near one which is why I don't go as often as I want but when we do, we always find a good deal. And really, kids don't know at this age the difference between new and slightly used. They just want to play!